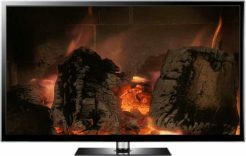 4K Christmas Screensaver Fireplace Video ideal for any screen in your home on Xmas Day. 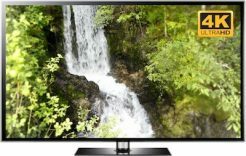 Choose an Ultra HD MP4 video, Full HD MP4 video, Ultra HD Windows screensaver, Ultra HD Mac screensaver and either screensaver in Full HD too. 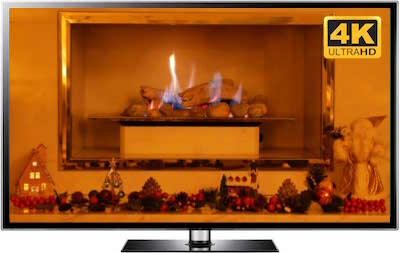 Download your very own Christmas virtual fireplace below. Christmas Fireplace is a modern gas fireplace filmed in 4K Ultra HD. You can view the full clip with promotional text below. Select 2160 4K from the settings icon, then the full screen icon next to it for the best quality. The downloadable versions are free from any text or branding. 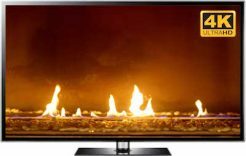 If you are looking for a 4K Christmas fireplace video for your 4K Ultra HD SMART TV screen of any size- this is perfect. Especially for modern homes. The resolution of the 20 minute MP4 video is 4K Ultra HD: 3860 x 2160 pixels. Four times larger than Full HD, making it suitable for TV screens even larger than 100 inches. 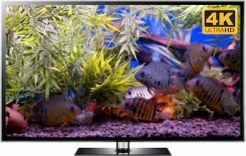 This is a warming festive TV screensaver which is the perfect video to loop on Christmas Day, especially in 4K resolution. If you do not have a 4K UHD TV yet, you can download the Full HD 1080p Christmas Fireplace video. It is also 20 minutes long and also comes with 5.1 surround sound. For a lovely calming and cozy addition to any room. Select repeat on your media player and you shouldn’t notice the loop every 20 minutes. This means you can leave it playing as long as you want on Xmas Day. You can also download Christmas Fireplace as a screensaver for Windows or Apple Mac laptops and PCs. 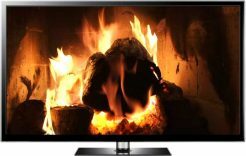 The 4K Christmas Fireplace Screensaver looks spectacular on big 27 inch iMac screens and other large computer monitors. 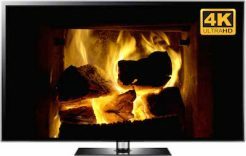 For most other laptops and PCs the HD Christmas Fireplace Screensaver will be more than good enough quality. With the screensavers you also get the opportunity to set a screenshot as your desktop wallpaper, plus it can be shown on dual screens. The screensaver versions are just 3 minutes and loop automatically to save computer resources. This is a gas fire, in a modern, classy room. Therefore it will really add a stylish ambiance to your Christmas Day. We have used warm tungsten lighting to give the whole scene a very warming effect. It is all about making a room feel cozier looping this 4K Xmas Fireplace Video. Just by having the rich golden colors on your screen, you should naturally feel more comfortable and happy on Christmas Day. This will really suit our lounge. Very classy, thanks Uscenes merry Christmas.